A Texas jury has awarded $37.6 million to a woman who sued Honda after being paralyzed in a 2015 car crash. 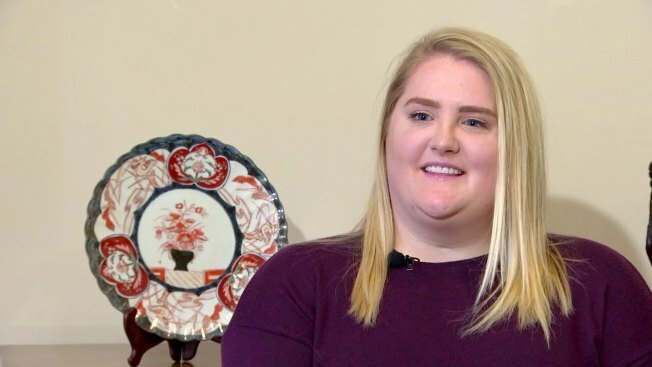 Sarah Milburn, 27, brought a case against the automaker over its seat belt design after her Uber driver ran a red light and the Honda Odyssey she was riding in was struck broadside by a pickup truck in Dallas, causing her vehicle to roll over and onto its side. "Probably the worst ride of my life," Milburn said. "I believe I was put in this (wheel) chair for a reason; to make sure this doesn't happen to anyone ever again." Milburn's lawyer, Jim Mitchell, said in a statement Thursday she suffered a broken neck and was left a quadriplegic. He argued that the seat belts in the Honda Odyssey were poorly designed and contributed to her injuries. The belts in the minivan's third row, where Milburn was seated, had a two-part system that the lawyer contended was unfamiliar and difficult to use for many people. "Specifically, the seat belt is a two-part system requiring the user to grasp a detachable shoulder strap from the van's ceiling, anchor it to the seat and then pull the belt across the user's hips and buckle it," Mitchell said. "In independent testing, an expert showed the jury that fewer than 10 percent of people who were unfamiliar with the van's two-part seat belt system were able to use it properly." Attorneys representing Milburn said 50 out of 53 people in their study failed to put the seat belt on the proper way and that "wearing it that way was actually more dangerous than having no seat belt at all." "What Honda said is, we met all federal regulations, and guess what? They did," said Milburn's attorney Charla Aldous. But this jury found that those federal regulations were not sufficient." Honda issued a statement to NBC 5 Friday saying the seat belt design meets federal standards and that if Milburn had worn it properly she would not have suffered serious injuries. “Honda is disappointed with the verdict in Milburn v. AHM and intends to vigorously appeal. The design of the seat belt system for the middle passenger in the third row seat in the 2011 Odyssey complies with all applicable federal safety standards and is similar in design to virtually all comparable minivans of this vintage. If it had been worn properly in this crash, the plaintiff would have suffered no serious injuries,” the company said. The family is hopeful the jury's finding will lead to the creation of "Sarah's Law," which would forbid automakers from using this seat belt system in the future. "We will change the seat belt system, " said Aldous. "This needs to be outlawed!" "It's not about the money for me. It's about the fact that, you know, this could have been someone else. It could have been a child and they probably wouldn't have come out as lucky," said Milburn. "I'm in a chair, but I can still talk. I can still move my arms. I can still smile, so I have to be thankful for what I have every day."